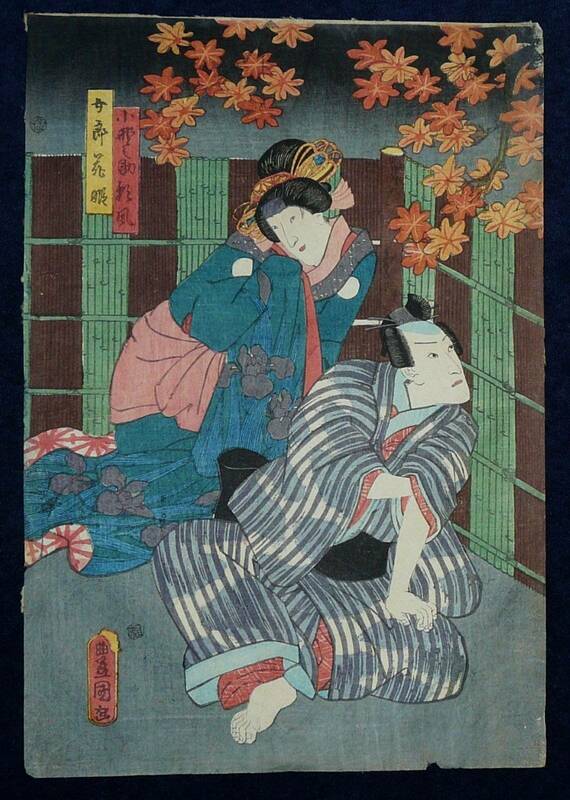 UTAGAWA KUNISADA was born in the Honjo district in 1786. 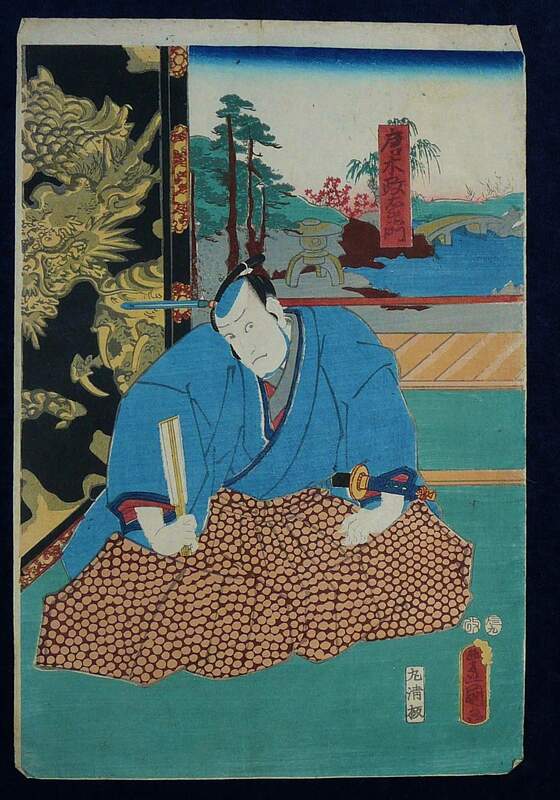 He entered the school of Utagawa Toyokuni the 1st (1786 to 1825) around 1800 as an apprentice at the age of 14. 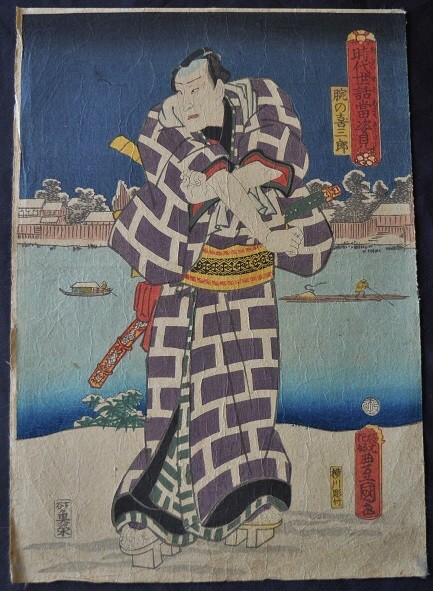 After the master (Toyokuni) Died Kunisada was permitted to use the name Toyokuni the third and his recorded signatures in versions, sometimes with both names, number around 200. Not all have been documented. He died in 1865. CENSOR SEAL: Aratame used from 1804. SIGNATURE: Toyokuni Ga in yellow border, red ground Toshidama Cartouche only used between 1847 and 1860 seen on Each Panel. CENSOR SEAL: One Round and One Oval Aratame only used from 1853 to 1857 on each separate panel. 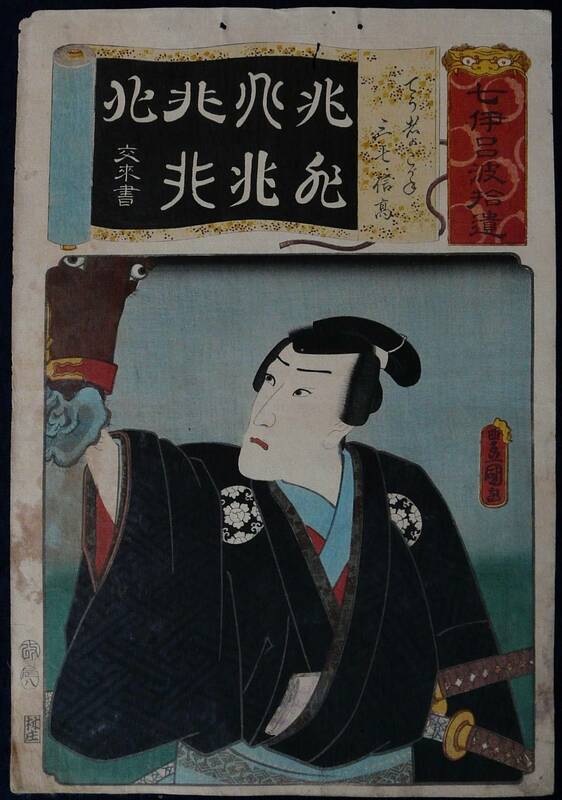 Also shown on each panel is the Hori Kakichi publisher’s seal. CONDITION: Very Good for Age – see photos. SIGNATURES: Toyokuni Ga in Red Ground Toshidama Cartouche found in the lower right of the scene and Yoshitora Ga in the panel depicting a samurai with his sword in the lower right corner. CENSOR SEAL: Aratame censor seal dated the 2nd Month 1864 in the left margin. 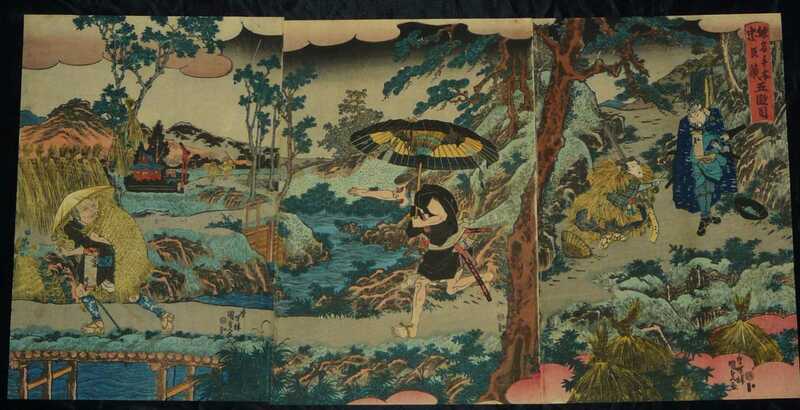 SIGNATURE: Toyokuni Ga in Red Ground Toshidama Cartouche found in the bottom left of the scene. CENSOR SEAL: Two censor seals one oval and one round only used between 1854 and 1857. SIGNATURES: Hachiju-o Toyokuni Hitsu Toyokuni Ga which means TOYOKUNI 80 YEARS OLD in Red Ground Toshidama Cartouche found in the bottom right of the scene. 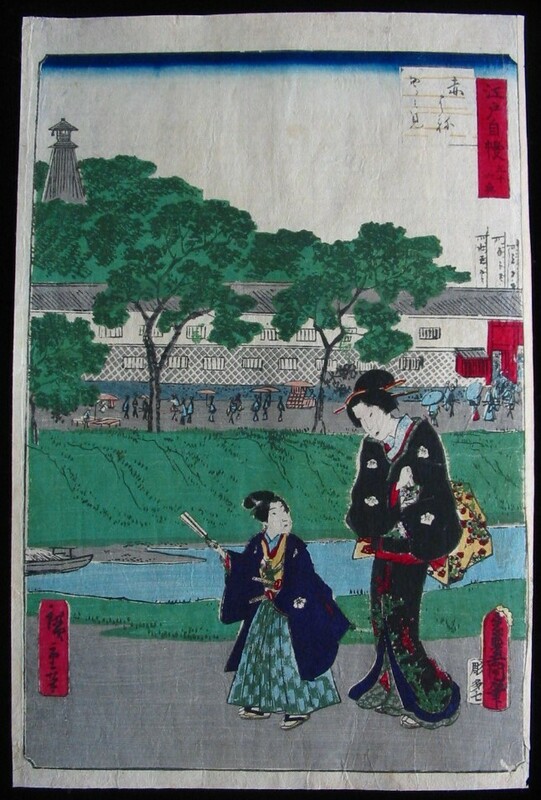 AND Hiroshige Hitsu which was used by Shigenoba until his marriage failed at the end of the year 1865 after which he was no longer allowed to use a Hiroshige signature. 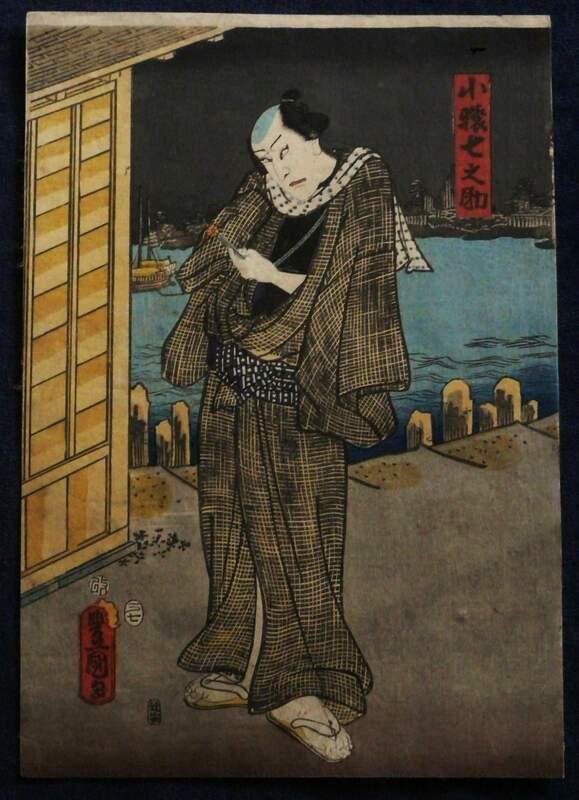 SIGNATURE: Ichiyosai Toyokuni Ga in Lower Left of Scene. CENSOR SEAL: Two Round Aratame Seals Only Used between 1847 and 1853. CENSOR SEAL: One Round Aratame only used for the 1860. CONDITION: Very Good for Age, some minor thinning and a very faint old fold mark on the edge of one panel. – see photos. SIGNATURE: Toyokuni Ga in Red Ground Toshidama Cartouche in Right of Scene. CENSOR SEAL: One Round and One Oval Seal Only Used between 1853 and 1857. CONDITION: Has some soiling and two holes in the top margin from old catalogue storage – see picture. CENSOR SEAL: One Round , One Oval Seal Only Used between 1853 and 1857. CONDITION: Good for Age – see picture. 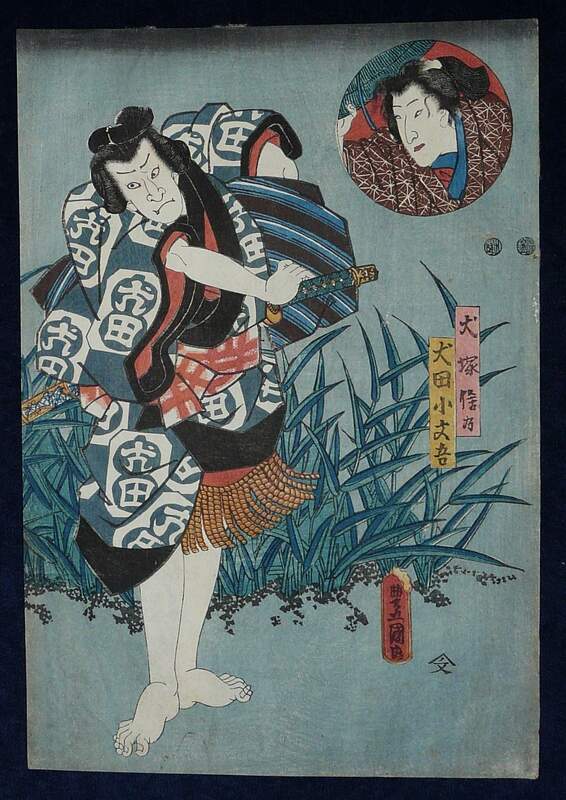 SIGNATURE: Toyokuni Ga in Red Toshidama Seal in Left of the Scene. CENSOR SEAL: Nanushi Seal only used between 1847 and 1853. 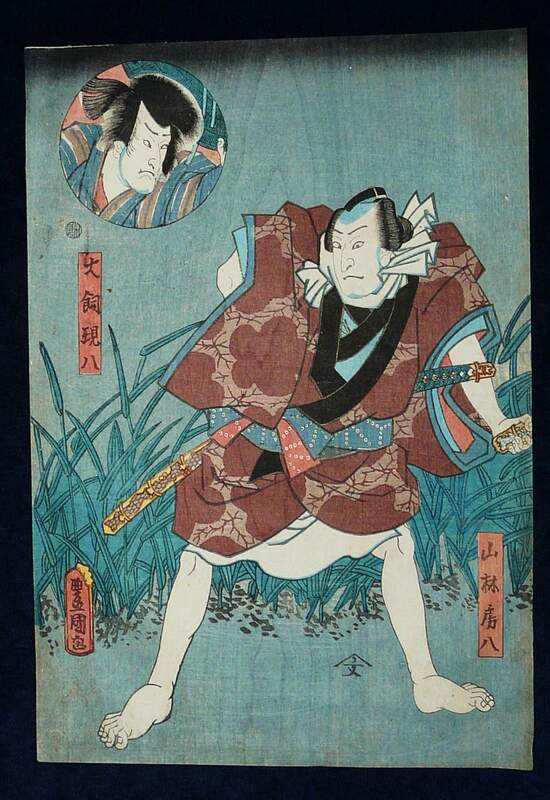 CONDITION: Good for Age with tiny area of damage in bottom left of washi. SIGNATURE: Shimoto ni Konomi Toyokuni Ga in Red ground Toshidama Seal in Lower Left of the Scene – This signature is recorder to have only been used between 1858 and 1861. CENSOR SEAL: Aratame Censor Seal from the Same Time Period. 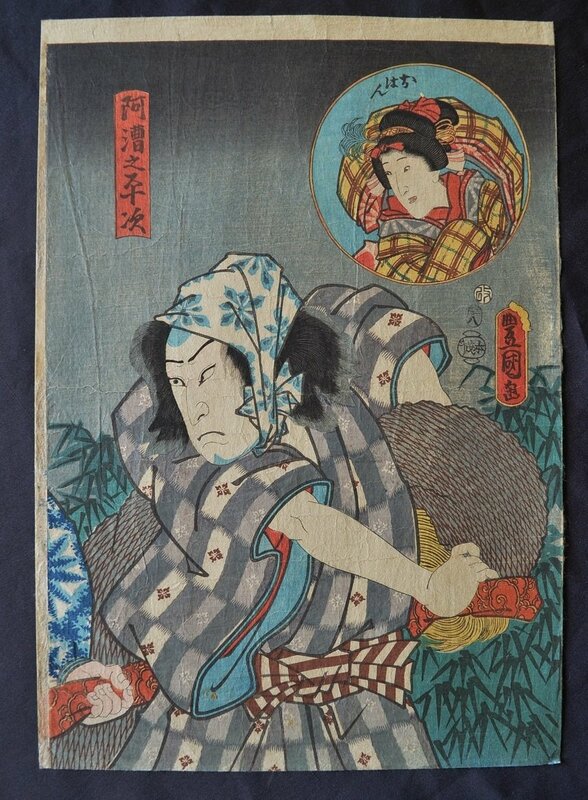 CONDITION: Good for Age – nicely age softened washi with some minor wrinkles – see picture. 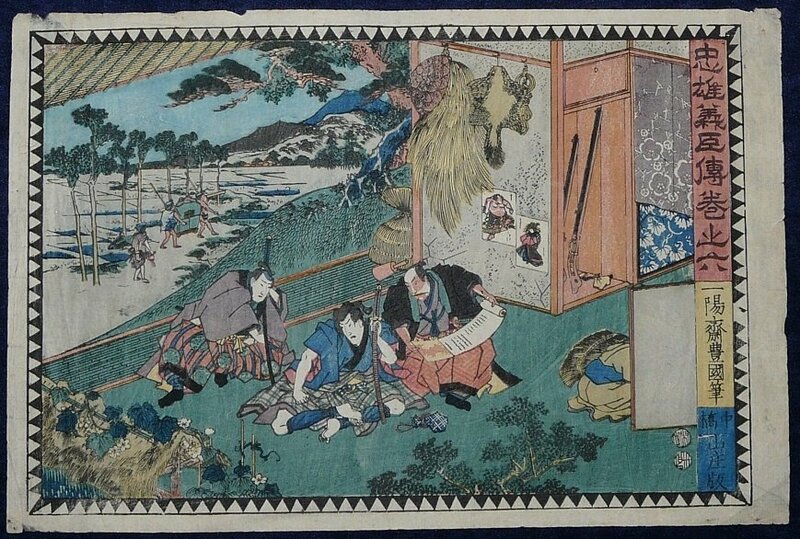 SIGNATURE: Toyokuni Ga in Red Ground Toshidama Cartouche in Lower Left of Scene. CENSOR SEAL: Two Nanushi Seals only used together between 1847 and 1853. CONDITION: Good for Age – see picture. Look at the fabulous wood grain from the woodblocks in the background. 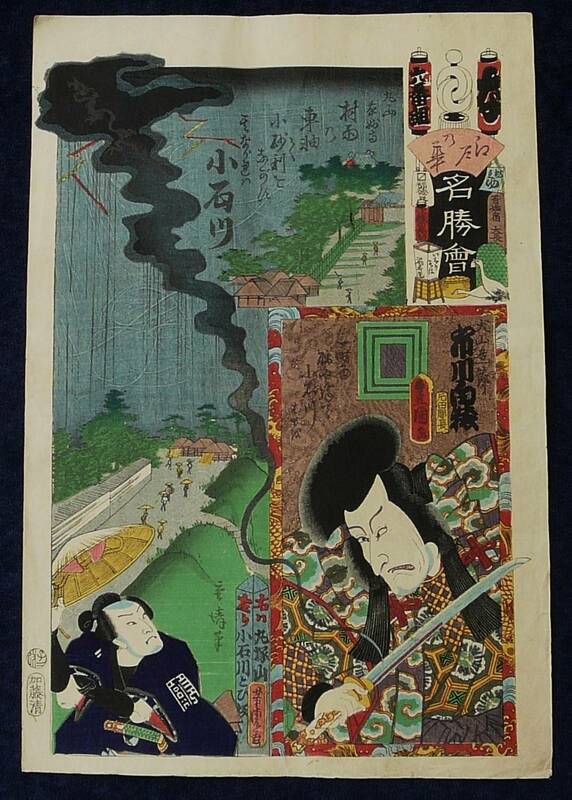 SIGNATURE: Toyokuni Ga in Red Ground Toshidama Cartouche in Lower Right of Scene. SIGNATURE: Ichiyosai Toyokuni Hitsu in Right Hand Side Panel. CENSOR SEAL: Two Round Seals only used together between 1847 and 1853. 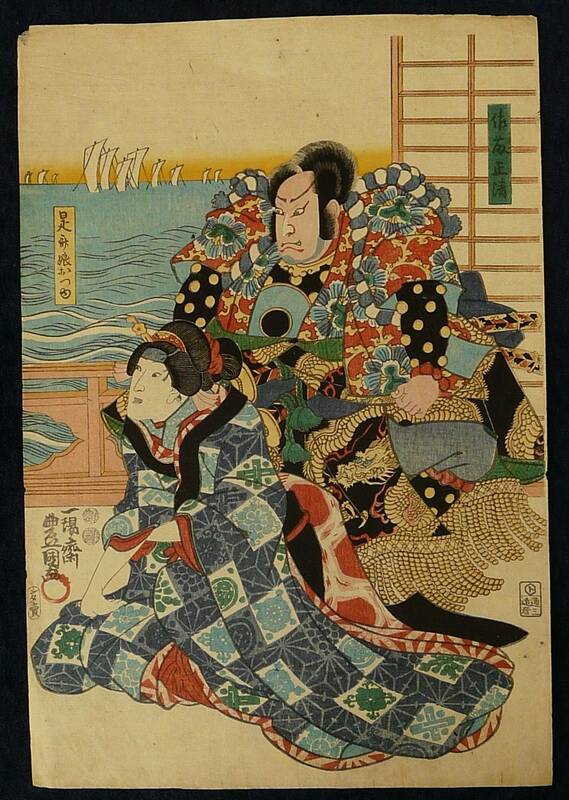 Also, please view our More Ukiyo-e Artists page for prints by: Chikanobu, Hashimoto; Hirokage, Utagawa; Sharaku, Toshusai; Ogata, Gekko; Shosai, Ikkei; Shuntei, Miyagawa and others.